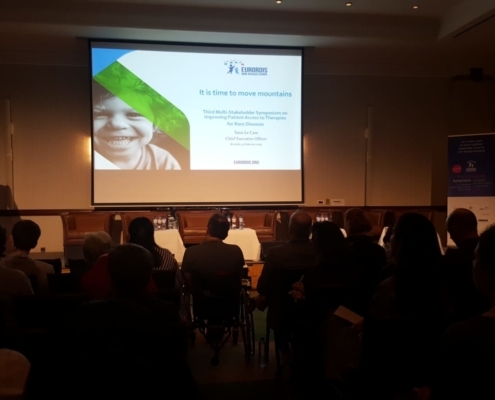 Martine Pergent (IPOPI President) and Johan Prevot (IPOPI Executive Director) attended the 3rd multistakeholder symposium on improving patients’ access to rare diseases therapies organised by Eurordis and which took place in Brussels on 13-14 February 2019. The event brought together around 250 participants including patients, patient group representatives, healthcare professionals, academic experts, policy makers, industry and other stakeholders. The programme featured plenary sessions as well as break-out sessions to discuss a range of topics including multi-stakeholder early dialogues to optimize determination of value, a blue print to fast track R&D and spend efficiently, a cooperation framework between national healthcare systems for the determination of fair prices and of sustainable healthcare budget impacts, and an approach to evidence generation in post-approval phase linked to healthcare budget spending. Overall it was recognized during the discussions that multi-stakeholder collaboration is a fundamental condition to achieving patient access to rare disease medicines. As such, in the break-out session that focused on multi-stakeholder early dialogues to optimize determination of value and on the importance of including patients in early dialogues around confirmatory clinical trials, IPOPI highlighted the importance of partnering with medical experts and researchers as well who often play a key role in addition to interacting with other stakeholders such as the clinical trial sponsor or HTA/Payers. As an example, IPOPI is currently partnering in two research projects funded through the European Commission’s Horizon 2020 programme on PID gene therapies: RECOMB and SCIDNET. Other conclusions included the recognition that; there is a need for a more trusted and transparent cooperation between payers and companies; and that the expectations for the European Reference Networks (ERNs) to be an important facilitator in evidence generation building is also an area of high interest that will be monitored closely over the coming years. The input from the workshop’s discussions and presentations will be used to prepare an outcomes document as a roadmap for all parties to collaborate in a process to improve patients’ access to rare disease medicines. The final version of the roadmap document will be shared by Eurordis in April 2019.